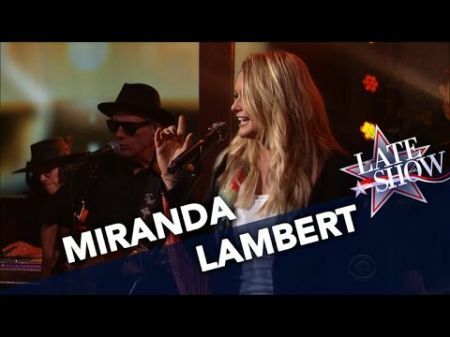 Country music singer Miranda Lambert is in full swing promoting her latest album, The Weight of These Wings. Last week she performed on "The Ellen Show" and last night she went on "The Late Show with Stephen Colbert" to sing her song "Highway Vagabond." Miranda Lambert did not perform alone last night. On stage with her was a 6-piece band, and one female back-up singer. During the show, Lambert was only the musical guest, and she did not sit down for an interview. It might have seemed a bit strange that Lambert decided to perform "Highway Vagabond" instead of her hit single "Vice," but it's not. That's because within the last month she had already performed "Vice" on both "The Ellen Show" and "The Tonight Show Starring Jimmy Fallon." Early next year Miranda Lambert will begin her Highway Vagabond Tour. The just under three month long headlining tour will mainly go to secondary markets, and not major cities. Tickets for Lambert's headlining tour are on sale now via her website here. In 2017 she'll also be appearing at many country music festivals. One of those is Off The Rails, which takes place May 6 & 7 in Frisco, Texas. Tickets for that music festival are on sale now at AXS.com.